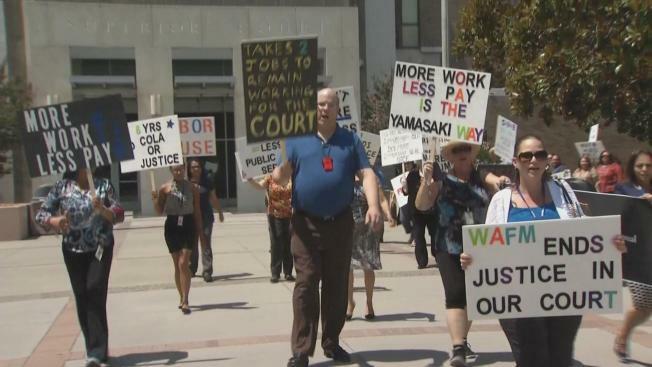 Santa Clara County Superior Court workers who are threatening to strike began preparing and rehearsing their picket line strategies Tuesday. While the strike is not yet official, several members of the Superior Court Professional Employees Association got a head start carrying signs and chanting in unison. "We work, they get paid!" the group repeated in chorus as it marched outside the courthouse in downtown San Jose. The 330 members already authorized a strike. They said they haven't received a pay raise in eight years and have been working without a contract for the past two years. And after contract talks broke down Monday, union leaders said a walkout was likely. "I'm hoping that possibly all courts, all the probate, civil, domestic, juvenile courts will be closed down," said Ingrid Stewart, union president. "Because we're just frustrated." Some specialists say the lack of staffing has caused a backlog of court processing. They hope a labor action will help. But other workers are also worried about putting their careers on the line. "I'm putting my home in jeopardy. I'm putting my ability to eat, survive in jeopardy," said Shelly Carey, a 30-year court specialist. Members met with the Sheriff's Office to figure out what actions are legal and what will get them into trouble. But some couldn't wait and took to the streets Tuesday, practicing their chants: "Long lines, no pay. We won't wait another day!" Court management did not respond to calls and messages Tuesday, but has said previously that it is operating under a $5 million budget deficit.